Multiplication Level: A female Pharaoh Ants can lay more than 400 eggs in her lifetime. Pharaoh Ants are very small (1/16” long) light yellow to reddish brown in colour with the abdomen (hind portion of body) somewhat darker. There is no stinger. Are Pharaoh Ants hazardous to humans? Yes. These ants are capable of mechanically transmitting diseases and contaminating sterile materials. Female Pharaoh Ants can lay 400 or more eggs in her lifetime. Approximately 10-12 eggs per batch. Unlike most ants, Pharaoh Ants breed continuously throughout the year in heated environments and mating occurs in the nest. A single queen can produce many hundreds of workers in a few months. What can I do if I have a Pharaoh ant infestation? Pharaoh Ants are much harder to control than other ants because of their ability to disperse. About 90% of the colony remains hidden in the nest. If 10% of the colony is killed by a residual pesticide the remaining reservoir of ants is enormous. It is recommended that you seek the services of a trained Pest Control Professional to eliminate pests for a thorough result. 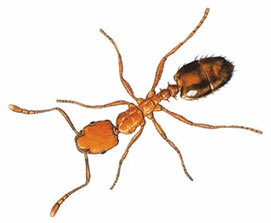 Anypest can get rid of ants for you with our expertise and knowledge. This entry was posted in Pests on 2013/08/22 by Any Pest.